By the early 20th century there were a large number of brands of paper available. There were differing levels of quality depending on your need but there wasn’t any dependable, inexpensive, and independent way to ensure that you were getting what was advertised in terms of quality. There also wasn’t a way to accurately compare the quality of two or more different brands. You could, of course, buy based on brand name and company reputation but, just like today, there were lesser known manufacturers who also made quality products available at much lower cost than the brand names. If your business depended on your use of a certain quality of paper (for example, printers and publishers) than you needed a way to accurately determine that quality. Enter the Ashcroft Paper Tester. While there were other paper testers available before the Ashcroft, these used rubber diaphragms that tended to wear, stretch and dry out. Others used a metal crown-shaped plunger which would actually stretch the paper giving you an inaccurate result. The Ashcroft Paper Tester was introduced after years of testing and was a high-quality, reliable, accurate, and relatively low-cost instrument. When introduced the Ashcroft Paper Tester sold for $20 which when adjusted for inflation comes to approximately $475 in 2014. The case was extra. 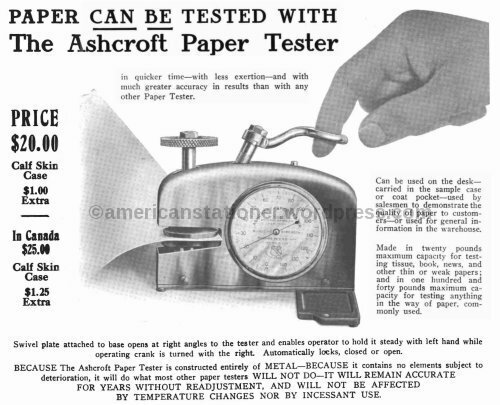 The Ashcroft Paper Tester was introduced in 1912. I’ve found advertisements and references to the tester up till 1948, but it would have been available for a longer time. A patent was applied for on July 5, 1912 and patent number 1048488 was granted December 31, 1912. The tester pictured above is marked on the dial “PAT. DEC.31,1912” which means it was made in 1913 or after. However, I have seen models that show “PAT. APPD. FOR” which means that Ashcroft Manufacturing started making these in 1912. There were two versions of the tester available. One, pictured above, tested bursting strength up to 140 lbs per square inch. The second one was for lighter paper types and tested up to 20 lbs per square inch. Modern standard 20 lb copier paper I’ve tested bursts at 35 psi. I noted above that the Ashcroft Paper Tester was available until at least 1948, but that’s not technically correct. By the mid-1940’s Ashcroft had become the Minden Paper Gauge Company. Below is a paper tester from Minden and you can clearly see on the dial that it states “formerly Ashcroft”. 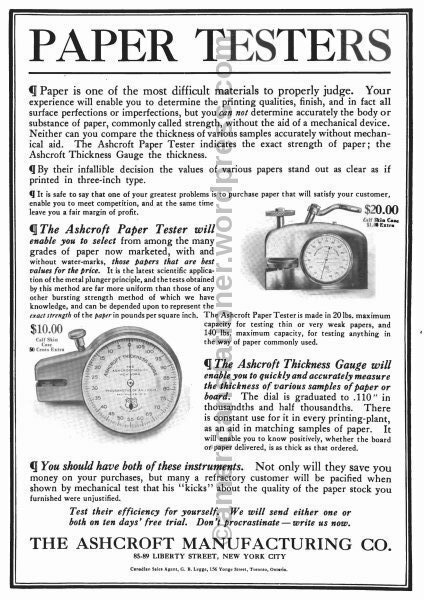 While this is the second version paper tester for lighter types of paper it shows that these type gauges were still being made into the 1940’s. Note the black crackle finish that was universally used during WW2 and helps date this particular item to the 1940’s. Ashcroft Manufacturing was started by Edward H. Ashcroft of Lynn, Massachusetts in 1851. Offices were opened in New York City and in Bridgeport, Connecticut. Mr. Ashcroft was more interested in engineering and sold his interest to his then head of sales, Charles A. Moore, eventually of Manning, Maxwell & Moore (MM&M). Charles Moore had purchased an interest in Ashcroft Manufacturing in 1873 and this may be when he took over Edward Ashcroft’s interest. One particular source I read on the internet gave 1912 as the date that Ashcroft Manufacturing became part of the MM&M family and this source has been quoted several times in this regard. However, records show that MM&M had acquired Ashcroft Manufacturing much earlier with reference found that this had not yet happened in 1878. However, references show that in 1888 Maxwell was President, Moore Vice President, and Manning Treasurer of Ashcroft Manufacturing. Since MM&M was incorporated in 1880 it would seem that by 1888 Ashcroft Manufacturing was part of MM&M and by 1896 it was explicitly stated in various advertisements and articles. 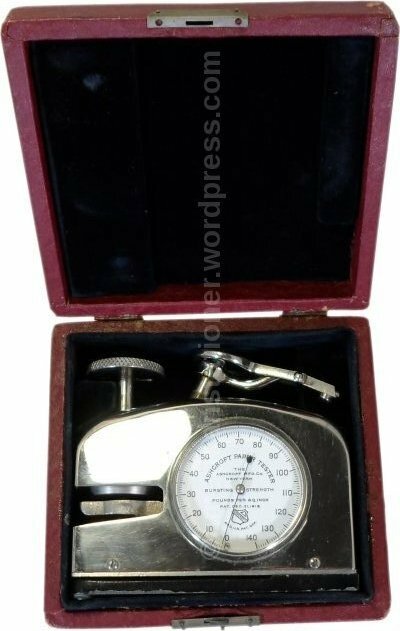 The Ashcroft Paper Tester weighs 2 lbs and measures 5.5″ L x 4″ H x 1.25″ W, and is made primarily of steel and a hard bronze composition. The body, clamp disc and plunger handle being made of chrome or nickel plated bronze. While this was something of a specialty item, it was a good seller in the U.S. and seemed to do well in foreign markets as well. They were made of such quality that even after a 100 years they work just fine.